When we connect more than one diode in a series circuit with a constant voltage, we need to connect to the circuit a resistor that limits the current through the diodes. In the absence of such a resistor the diodes could burn. This resistor sets the operating point in the V-A characteristic of the diodes. Provided that we know the supply voltage, the number of diodes (which must be the same), their voltage drop and current, we can determine the required limiting resistor. Let's start with entering the value of the constant supply voltage, which we have (Vdc). In the field (box) of the voltage drop of the diode (Vf LED) we enter the relevant drop of the diodes that we have. We enter the operating current of the diode in the box If LED. If the voltage drop is greater than the supply voltage, a red text will appear, stating that we need to choose either higher supply voltage or diodes with a smaller voltage drop. We enter the number of diodes in the box LED Qty. 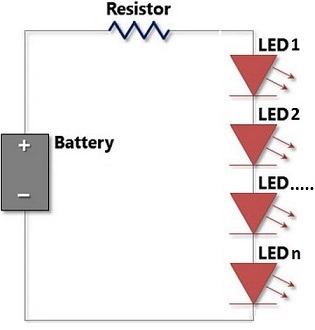 The scheme automatically determines the resistance of the required resistor in Ohm. If we do not know the value of the voltage drop on the diode, we can select values from the drop-down menu. If the diodes are not the same, either the weakest one will burn, or the strongest one will emit less light. After the calculation is done the scheme finds and recommends the closest standard value of the resistance and the resistor’s power because not always the calculated value corresponds to a standard resistor.